Minecraft will undergo some hefty improvements and additions in the next year as the Microsoft-owned gaming company, Mojang, works to please and maintain its community. At a panel on Sunday during Minecon 2015, a Minecraft convention held in London over the weekend, Mojang developers announced several upcoming features for the console, desktop and mobile versions of the game. The hourlong panel featured Mojang’s Owen Hill, Daniel Wustenhoff, Tommaso Checchi, Jens Bergensten and Nathan Adams, and the audience was about two-thirds adults and a third children, The Guardian reports. First released in 2009, the game involves building worlds out of virtual bricks. A creative and an adventure mode focus on constructing and exploring lands, while a survival mode allows for battling opponents. Below are several of the main updates coming to the game, with accompanying videos from Twitter user and Minecraft player @FoxyNoTail. 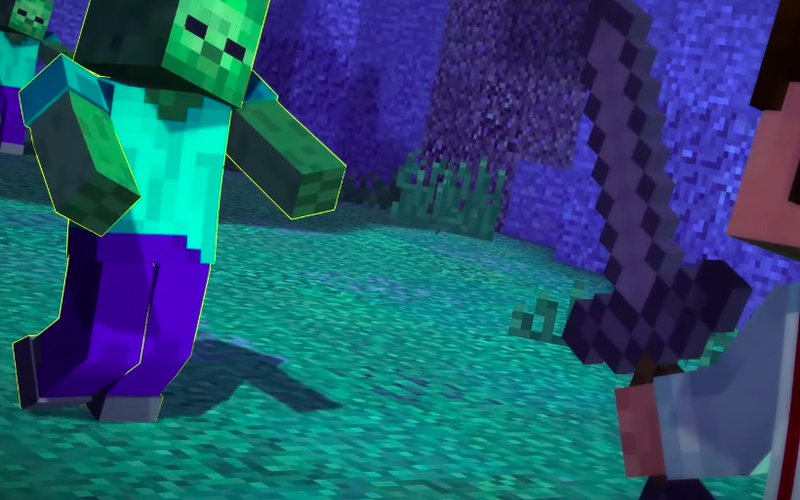 Minecraft players will now be able to equip their characters with two items, one in each hand. That could mean weapons or other tools. For example, a player could hold a pickaxe and a set of torches, IGN notes. Another update will add shields and custom-made banners to a player’s collection. The Ender Dragon, a monster players must beat at the end of the game on Minecraft’s desktop version, will become more difficult. Players will also have the ability to respawn the dragon. But don’t expect a baby version. “A baby dragon would be too cute to kill,” Mojang’s Adams said. Mojang will also introduce a new mob called the Shulker that will shoot projectiles. Mojang revealed a new game area with a purple and yellow color scheme at The End of the game. In this land, players can levitate and avoid the projectiles sent by the Shulker mob. That levitation effect helps players reach the top of cities, outside of the typical ladders found in other areas. The Pocket Edition, Minecraft’s mobile version on iOS, Android and Windows, will also undergo some revamping with the addition of regions and items found on the console and desktop games. Earlier this week, Mojang revealed that Minecraft has hit over 70 million sales since its first PC version was released in 2009, Polygon reports. Microsoft took the hint about the company’s growing popularity and acquired the Stockholm-based game studio and thereby the rights of Minecraft in November for $2.5 billion. Other major updates for the company include a spin-off game called “Minecraft: Story Mode.” Mojang premiered a trailer for the upcoming game at the convention on Saturday. There is no official release date. Virtual reality with Minecraft is also on the way as Mojang works with its owner, Microsoft, on developing the game for the company’s holographic headset HoloLens. A Minecraft feature film is expected by 2017. This year was the fifth consecutive year of a convention specifically dedicated to Minecraft and hosted by developer Mojang. The convention was held at London's ExCeL London Exhibition and Conference Centre Saturday and Sunday.